We present Aggregate G-Buffer Anti-Aliasing (AGAA), a new technique for efficient anti-aliased deferred rendering of complex geometry using modern graphics hardware. In geometrically complex situations, where many surfaces intersect a pixel, current rendering systems shade each contributing surface at least once per pixel. As the sample density and geometric complexity increase, the shading cost becomes prohibitive for real-time rendering. Under deferred shading, so does the required framebuffer memory. AGAA uses the rasterization pipeline to generate a compact, pre-filtered geometric representation inside each pixel. We then shade this at a fixed rate, independent of geometric complexity. By decoupling shading rate from geometric sampling rate, the algorithm reduces the storage and bandwidth costs of a geometry buffer, and allows scaling to high visibility sampling rates for anti-aliasing. Discrete voxel representations are generating growing interest in a wide range of applications in computational sciences and particularly in computer graphics. In this chapter, we ﬁrst describe an efficient OpenGL implementation of a simple surface voxelization algorithm that produces a regular 3D texture. This technique uses the GPU hardware rasterizer and the new image load/store interface exposed by OpenGL 4.2.The first part of this chapter will allow to familiarize the reader with the general algorithm and the new OpenGL features we leverage. In the second part we describe an extension of this approach, which enables building and updating a sparse voxel representation in the form of an octree structure. In order to scale to very large scenes, our approach avoids relying on an intermediate full regular grid to build the structure and constructs the octree directly. This second approach exploits the draw indirect features standardized in OpenGL 4.0 in order to allow synchronization-free launching of shader threads during the octree construction, as well as the new atomic counter functions exposed in OpenGL 4.2. 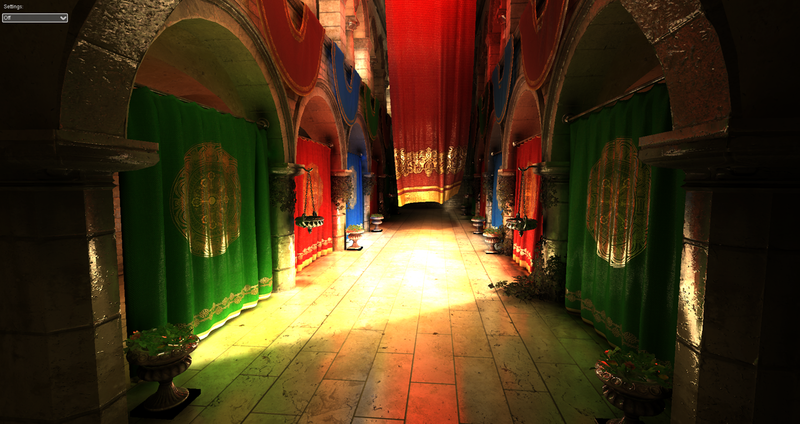 Indirect illumination is an important element for realistic image synthesis, but its computation is expensive and highly dependent on the complexity of the scene and of the BRDF of the involved surfaces. While off-line computation and pre-baking can be acceptable for some cases, many applications (games, simulators, etc.) require real-time or interactive approaches to evaluate indirect illumination. We present a novel algorithm to compute indirect lighting in real-time that avoids costly precomputation steps and is not restricted to low-frequency illumination. It is based on a hierarchical voxel octree representation generated and updated on the fly from a regular scene mesh coupled with an approximate voxel cone tracing that allows for a fast estimation of the visibility and incoming energy. Our approach can manage two light bounces for both Lambertian and glossy materials at interactive framerates (25-70FPS). It exhibits an almost scene-independent performance and can handle complex scenes with dynamic content thanks to an interactive octree-voxelization scheme. 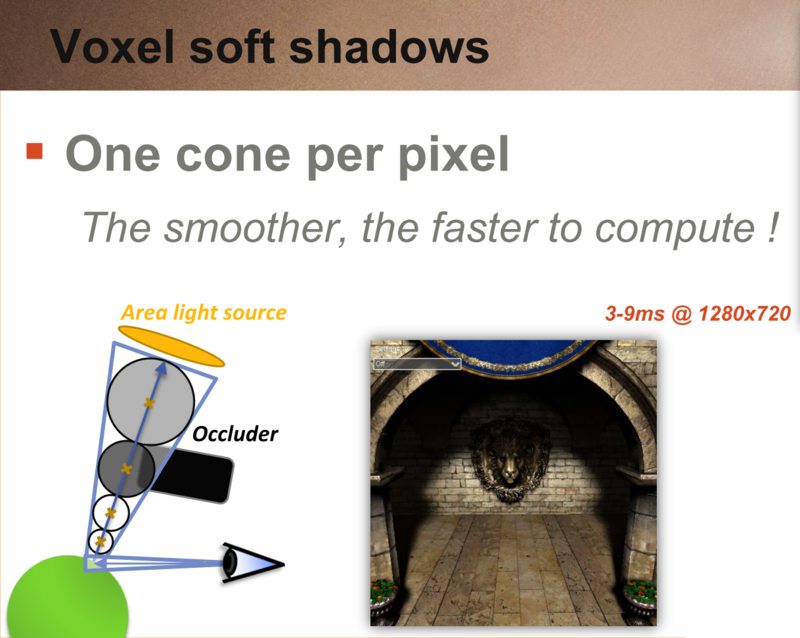 In addition, we demonstrate that our voxel cone tracing can be used to efficiently estimate Ambient Occlusion. 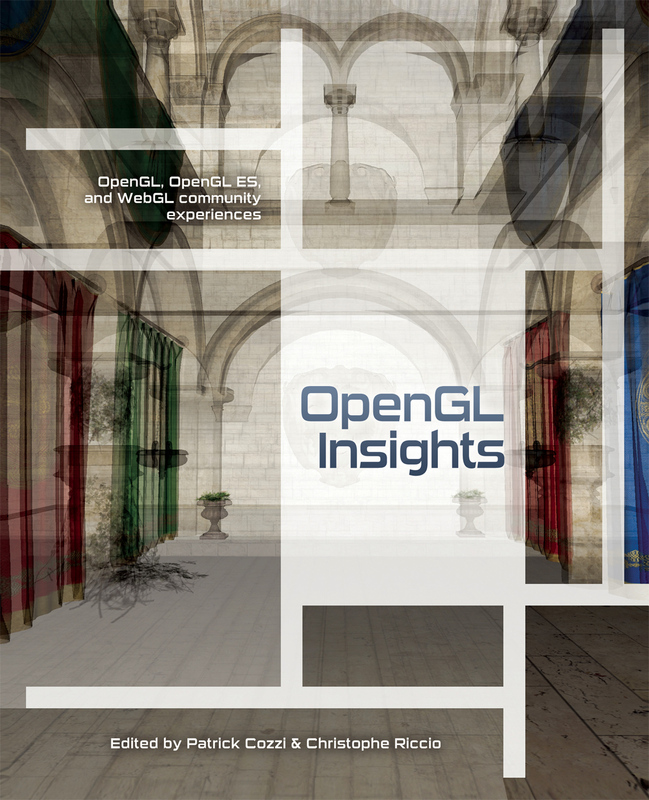 In this thesis, we present a new approach to efficiently render large scenes and detailed objects in real-time. Our approach is based on a new volumetric pre-filtered geometry representation and an associated voxel-based approximate cone tracing that allows an accurate and high performance rendering with high quality filtering of highly detailed geometry. 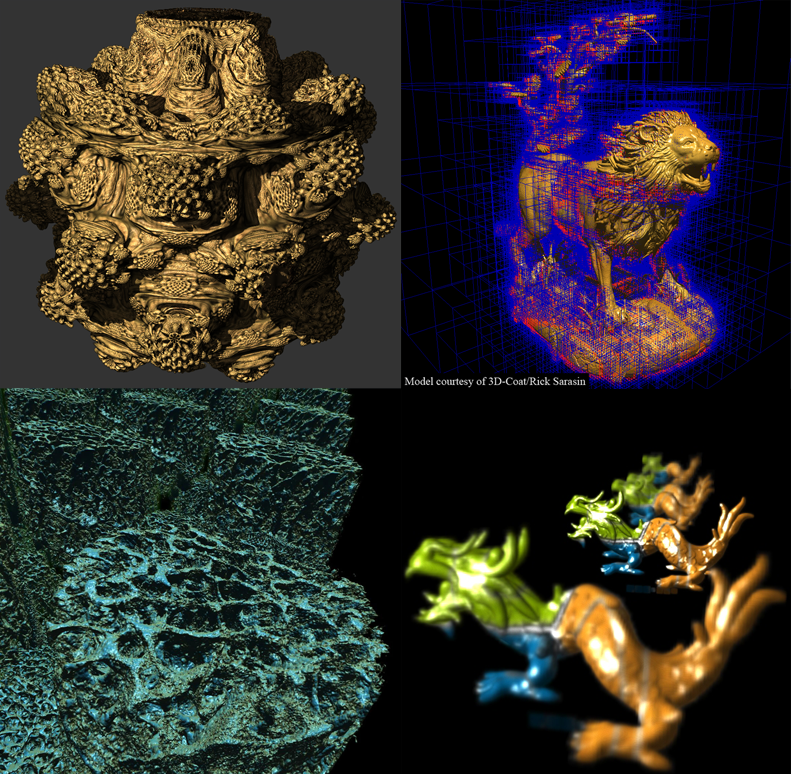 In order to bring this voxel representation as a standard real-time rendering primitive, we propose a new GPU-based approach designed to entirely scale to the rendering of very large volumetric datasets. 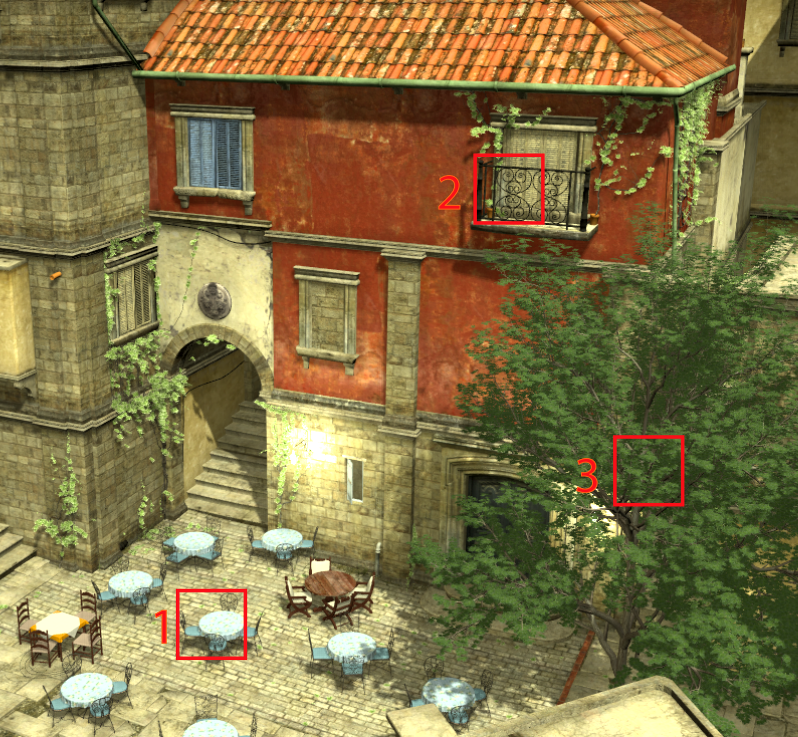 Our system achieves real-time rendering performance for several billion voxels. Our data structure exploits the fact that in CG scenes, details are often concentrated on the interface between free space and clusters of density and shows that volumetric models might become a valuable alternative as a rendering primitive for real-time applications. In this spirit, we allow a quality/performance trade-off and exploit temporal coherence. Our solution is based on an adaptive hierarchical data representation depending on the current view and occlusion information, coupled to an efficient ray-casting rendering algorithm. We introduce a new GPU cache mechanism providing a very efficient paging of data in video memory and implemented as a very efficient data-parallel process. This cache is coupled with a data production pipeline able to dynamically load or produce voxel data directly on the GPU. One key element of our method is to guide data production and caching in video memory directly based on data requests and usage information emitted directly during rendering. We demonstrate our approach with several applications. We also show how our pre-filtered geometry model and approximate cone tracing can be used to very efficiciently achieve blurry effects and real-time indirect lighting.